rideTYRANT.com: TNT on Lock Down! So the TNT Trails are about to be locked down! I'm installing 20 gauge galvanized chicken wire fencing along the wooded portion of the property line tonight. The fence will be elevated 10" off the ground so the local wildlife can pass through (raccoons, rabbits, squirrels, etc.) and will have an overall height of 5' to keep unwanted visitors out. 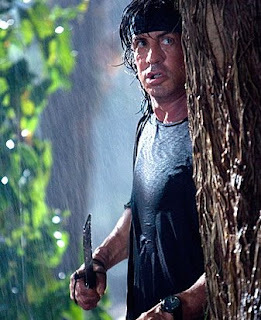 If the trespassing problem continues after tonight I'm just going to contact Johnny Law...or maybe John Rambo! Bummer! You need signage. "Trespassers will be shot. Survivors will be shot again." Now if I can just cut my bars down to 10", I'll be all set. I hung signage all along the property line. 2 "Private Property: Keep Out" signs, 4 "No Trespassing" signs, and 1 "No Hunting or Trespassing: Violators Will Be Prosecuted" sign...but this is Podunk we are talking about. For all I know they are illiterate!